Since its introduction more than a decade ago, NGINX has become the most popular web server for busy websites. More than 160 million websites use NGINX, including more than half of the top 100,000 websites. With NGINX having reached such popularity, it makes sense to use NGINX for all your web‑serving needs, and additionally to take advantage of its capabilities as a reverse proxy server, caching server, load balancer, and more. This blog post guides you in getting NGINX and NGINX Plus up and running on Ubuntu 16.04 on Amazon Web Services (AWS), an easy‑to‑use setup that doesn’t affect the settings on your personal computer. This blog post covers both NGINX and NGINX Plus. 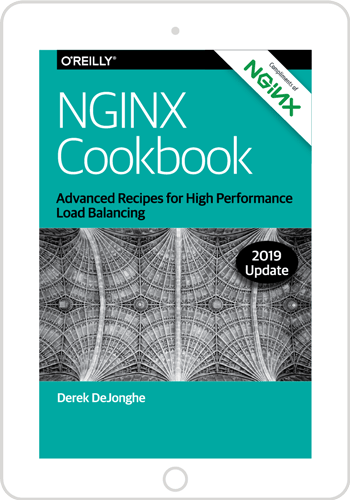 Once you complete the steps given here, you may want to continue with the NGINX Core training, a full‑day course where you’ll learn how to configure, administer, and manage NGINX. The course also readies you for our other instructor‑led and self‑paced courses on advanced topics. For this tutorial, you need a terminal to connect to your Amazon Elastic Compute Cloud (EC2) instance. Macs have a built‑in terminal, but Windows users need to download PuTTY or an equivalent tool. If you prefer to use your own local terminal to set up NGINX or NGINX Plus and serve web content, feel free to skip to Setting up AWS. On Macs, you can use the built‑in terminal tool to do everything in this tutorial. Click the magnifying glass icon at the right end of the top bar on the screen. Type terminal in the pop‑up box and press Enter. A separate terminal window opens. Windows doesn’t come with a built‑in terminal, so you will need to download one from the internet. PuTTY is a common ssh client used ubiquitously throughout the world. Download and install the file in a location of your choice, then open it. You can’t access the actual terminal until you finish the steps in the next section, however. 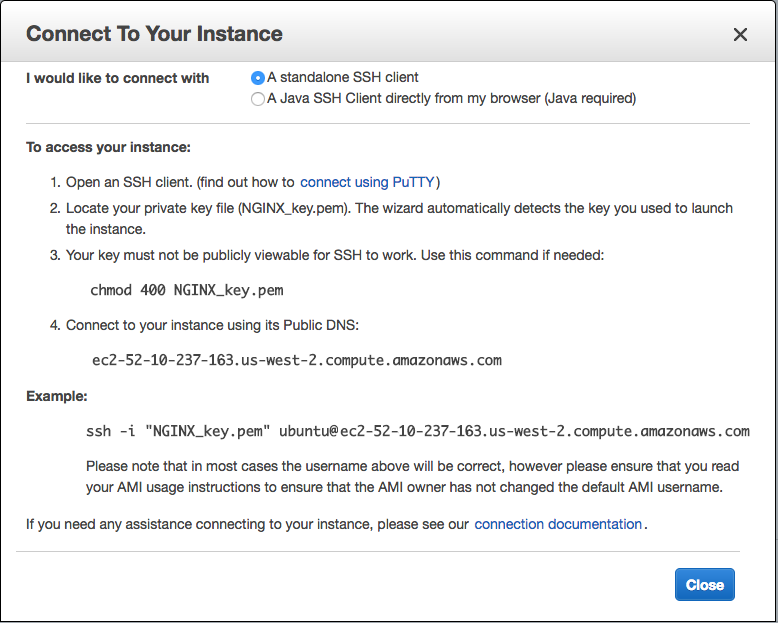 Set up your AWS deployment by creating an EC2 instance and connecting to it. 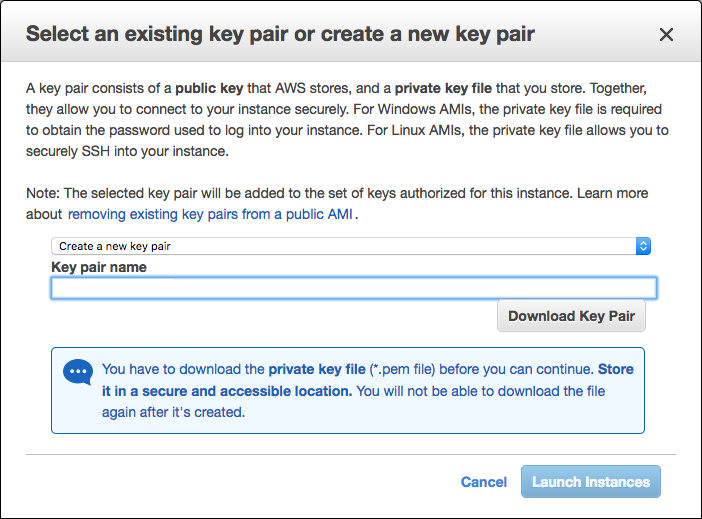 On the AWS home page, sign in to the (AWS Management) Console or create a new account. Click Services in the top Console navigation bar, then EC2 in the Compute section. Click the Launch Instance button on the page that opens. On the Step 1 page, click the Select button In the Ubuntu Server 16.04 LTS (HVM), SSD Volume Type row. On the Step 2 page, select the t2.micro instance type, which as of this writing is marked Free tier eligible and selected by default. At the top of the window, click 6. Configure Security Group. On the Step 6 page, click the Add Rule button below the table, then select HTTP in the Type column. We are allowing access to our instances from any IP address (the value in the Source column is Anywhere). Repeat Step b for HTTPS. Click the Review and Launch button at the bottom of the page. On the Step 7 page, click the Launch button at the bottom. Select Create a new key pair from the upper drop‑down menu. Type a name in the Key pair name field, such as NGINX_key. Click the Download Key Pair button. In your file manager utility, move the downloaded .pem file to a secure location. For the tutorial we’re placing it in the /Desktop/NGINX directory. Click the Launch Instances button. On the Launch Status page that opens, click the View Instances button at the bottom. Click the pencil icon in the Name column. Type the name in the field and click the check‑mark icon. Click the Connect button at the top of the screen. A window like the following pops up. Follow the directions on the pop‑up to finish connecting to your instance (including the ones accessible by clicking connect using PuTTY, if you’re using Windows). This includes pasting the sample ssh command into your terminal once you’ve navigated to your key. Now that you have your AWS virtual machine (EC2 instance) set up, it’s time to install either the open source NGINX software or NGINX Plus, which is available for free in a 30‑day trial). Both options work in the context of this tutorial, but if you want to further explore the advanced features in NGINX Plus, please request a free trial. Continue to Opening Your Web Page. If you don’t already have NGINX Plus, then sign up for a 30‑day free trial. When you receive notification that your subscription is available, log in at the NGINX Plus Customer Portal. Access the installation instructions by clicking either of the hyperlinks shown in the screenshot. When installation is complete and NGINX Plus is running, continue to Opening Your Web Page. Select the instance’s IP address in the Public DNS Address column and copy it into the paste buffer. Now that we know we have a working version of NGINX or NGINX Plus installed, it’s time to put it to good use! Let’s begin by setting up some files and directories. Change directory to your home directory if you are not already there. In the following instructions, it is /home/ubuntu. Create a folder called public_html and change into it. Inside the new folder, create a file called index.html and a folder called application1. In the application1 folder, create a file called app1.html with some text in it. Change back to your home directory. Create a folder called data. Within the data folder, create a folder called images. Our first use case for NGINX or NGINX Plus is to serve pages and images to the user via our web page. Rename default.conf to default.conf.bak to prevent NGINX or NGINX Plus from using it as the default configuration file. In the ~/data folder, create a folder called server2. In the server2 folder, create a folder called sampleApp. Inside the sampleApp folder, create a file named index.html and write some text in it. So that’s it! You now have a working Ubuntu instance running NGINX, which is ready to run as a proxy server. In this post, we learned how to serve files and images over the Internet, as well as configure it as a reverse proxy. If you have any questions about the tutorial, we offer an NGINX Core training course that covers this material in much more depth. The course also covers some of the essentials in web‑serving and application delivery, such as load balancing, location routing, and security. You will have a chance to speak to an expert in the field about any questions you have, as well as delve deeper into the power of NGINX and NGINX Plus.